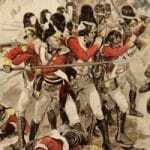 On March 21st 1801 a battle was fought outside Alexandria which resulted in the 28th (North Gloucestershire) Regiment being awarded a unique distinction. The army was led by General Sir Ralph Abercrombie and the 28th were part of the Reserve Division under the command of Major General Sir John Moore, occupying an unfinished redoubt in advance of a key position of the British defences. Thus exposed on low sandhills by the sea shore, they were subject to the full brunt of the French attacks. In one of these attacks the 28th were simultaneously attacked front and rear, but due to their steadiness and their devastating volleys they managed to turn the battle at a crucial time and inflict a significant defeat on the French for the first time in 30 years. Like Wolfe before him, Abercrombie was to die in the hour of his greatest victory. The gallant action of the 28th has been commemorated by the privilege of wearing the emblem of the Egyptian Sphinx on the back of the headdress. To this day, 21st March is known as Back Badge Day and celebrated accordingly. Sergeant Joseph Coates of the 28th described the action in his memoir of the Egyptian campaign. (It should be noted that Coates ascribes the famous order to Colonel Paget, although, since Paget had been wounded in the throat, it is perhaps more likely that it was his second in command, Lieutenant Colonel William Chambers, who gave the order). The 61st (South Gloucestershire) Regiment was also involved in the Egyptian Campaign. In 1801 they were sent to India but were diverted to Egypt to take part and, after landing at Kosseir on the Red Sea, marched 130 miles across the desert to the Nile in nine days with the loss of only one man. Although they arrived too late to play an active role against the French Army, the Regiment was awarded Egypt as a a battle honour and the right to wear the Sphinx on its badge. Both attempts were to end in failure and Cleopatra’s Needle had to wait until 1877 before leaving Egypt to find a new home in London the following year. Picture: The 28th Foot at Alexandria.